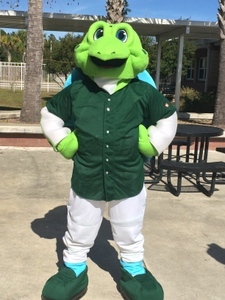 The storied Daytona baseball club changed affiliations in the 2014 offseason from the Cubs to the Reds, saying a fond good-bye to Cubby, their longtime mascot, and recruited a young, driven turtle named Shelldon to take the helm. To help him weather the humid heat of the coast Keystone Mascots integrated vent holes where you see his green freckles on the top of his head. A battery powered fan, and a reserve set of batteries, also aid in his heat tolerance. Unlike other turtles in Mascotdom Shelldon was built to be able to change his shirts around. His shell is light and easy to wear and his torso is breezy with ample jersey mesh to keep him cool. Shelldon was a pleasure to bring up to speed for the Daytona ballclub. He may not be the fastest, but he's sure and focused on the fans of the town. Keystone Mascots welcomes the new character to Florida!